CALGARY (Jan. 26, 2018) — In 2016, we had the sci-fi movie “Arrival” based on the short story by Chinese American writer Ted Chiang. Chiang’s story is an eloquent statement conveying the idea that not all aliens arriving planet Earth are necessarily hostile and enemies of the human race. Along the same line of thoughts, in 2017, we have “The Shape of Water”. Guillermo del Toro’s fantasy has garnered 13 Oscar nominations for the upcoming 90th Academy Awards on March 4, 2018. It is a fairytale love story that is so relevant for our society today. This time, not an outer space arrival, but an Amphibian Man from another part of the world, captured and shipped to a high security science research center in the U.S. In other words, an alien just the same. The film is set in the Cold War era during the 1960’s. Richard Strickland (Michael Shannon) oversees a new arrival from the Amazon (South America that is), a monstrous beast, and if he cares to really examine the creature with an appreciative eye, a beautiful Amphibian Man (clandestinely played by Doug Jones). The reverse of Hans Christian Andersen’s The Little Mermaid. In the research center is Dr. Holffstetler (Michael Stuhlbarg), who has to tend to his covert mission, it is the Cold War after all. From Holffstetler’s enquiring scientific eye, the Amphibian Man does have its value and should be treated as a thinking and feeling living being. 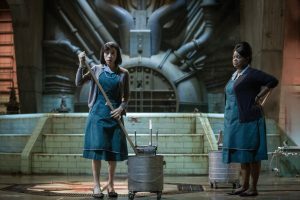 At the bottom of the rung in the research center are the janitorial staff, Elisa (Sally Hawkins) and Zelda (Octavia Spencer), and with them the story comes alive. Hawkins and Spencer’s duo performance is worth your movie ticket. They are the heart and soul of the story, something which the villain lacks. As a fairytale, we can identify who that is right away, and the irony of who the monster is quickly becomes apparent. Elisa is mute, she cannot speak but can hear what you say, so be careful. She knows a language that you’ll need a translator to understand, so be careful about that too. Thanks to Zelda, her official interpreter, she knows what not to translate as Elisa speaks her mind to ruthless Strickland. As she cleans the facility, Elisa soon comes to appreciate and love the Amphibian Man, and the creature relates to her as she is, not as a handicapped, low-ranking cleaner. The two forge a bond stronger than any dangerous obstacle. Elisa’s neighbor is Giles (Richard Jenkins), an artist who sees the beauty in the foreign creature. He is of immense help to Elisa, a faithful friend to her even to the point of endangering his own life. As a fairytale, we see the good among the characters in sharp contrast to the villain. The film moves into the second half as a thriller and leads us to see how love can overcome dangerous obstacles, love not just between the two obvious characters, but from those built upon friendship and mutual respect. As for the Amphibian Man, he is more powerful than just brute force as the story reaches its climax. The film offers some interesting cinematic visualization, like the beginning scene of Elisa’s apartment under water. Towards the end, the underwater romantic rendition is an inspiring art work. Coincidentally, the scene elicits another indelible cinematic moment from my memory, an underwater love scene also involving a woman who cannot speak in a film with which Marlee Matlin won her Best Actress Oscar with her heart-wrenching performance. That’s Children of a Lesser God (1986). Just one shy of Oscar records, the 13 nominations include Best Motion Picture, del Toro for Best Director and Original Screenplay, Hawkins for Best Actress and Spencer for Supporting Role, Richard Jenkins for Best Supporting Actor, together with several deserving technical recognitions. 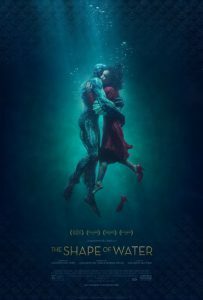 “The Shape of Water” is a simple depiction of human longings and our universal need for connection. It’s a fairytale love story, an allegory, and not a treatise on controversial subjects for debates. Surely, water, the shape of it, all enfolding, is the main idea, for that’s what love is like.